One of the mainstays of the iPhone X is not just everything new it has brought, we remember the OLED screen edge to edge, the absence of physical button or the TrueDepth system, maybe it is the biometric identification system called Face ID . This technology has given rise to many hours of debate about its supposed reliability. Apple claims that the false positive rate is 1 in a million. Something really incredible and that makes it a really safe system. But it seems that there is a technique capable of showing that the system can be deceived. 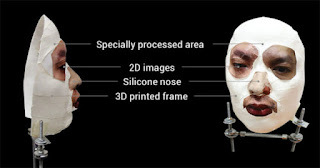 And in it is involved a silicone mask, in 3 dimensions and a two-dimensional image of eyes and mouth . Let's learn more about this curious experience. We know that the Face ID, through its TrueDepth camera system, makes a three-dimensional scan of its owner's face, and not only that, it is able to learn over time to adapt to the different changes. This Vietnamese company has shown in a video how making a 3D impression in silicone, resembling the texture of the skin, is able to deceive this system . In the video that we have shown you, it is possible to appreciate how the system has really been circumvented , all with a material that is increasingly common in the domestic sphere and that is no other than a 3D printer. You probably will not do the test of scanning a face, add some eyes and a mouth and try it, but if you dare to do it you could get it. So neither the Face ID, if we propose it, is as accurate as Apple wants us to see , nor is it a completely infallible system. What do you think of this experience? Do you see it feasible in the domestic environment?